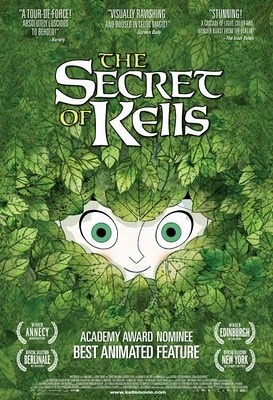 The Secret of Kells was almost one of the first movies I saw at the theater this year. The Secret of Kells was nominated for an Oscar and playing at the nearby Brooklyn Heights Cinema, but seeing it didn’t work out for one reason or another. Once Netflix made it available to instant stream, my desire to see it was renewed. 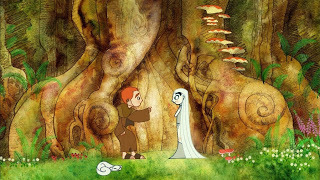 The animation in The Secret of Kells is beautiful. The colors really pop, especially in HD. But for a long stretch of the movie, I felt like I was just staring at pretty, moving pictures. When it came to the story, I was sitting there thinking “Huh?” for a good part of the movie. Eventually I caught up to what was going on, but more of The Secret of Kells might have been behind me at that point than ahead of me. This would be a fine way for the plot to work if The Secret of Kells was a mystery, but it’s not. The Secret of Kells is as pretty as it is confusing. Whenever characters would look at the Book of Kells, their faces would be covered with a golden glow emanating from the book. It only took 15 years, but we now have the answer to what is that damn briefcase in Pulp Fiction. Vincent Vega’s original line “That Irish book is so beautiful.” was shortened in the final cut. The Secret of Kells was a bit of a let down. It was okay, but I’m guessing its Oscar nomination was due more to the gorgeous animation and not the so-so, hard to understand story. I agree with you 100% on the story. I know the history of the book, so I wasn’t out of the loop, however in the end it was a very dull plot. However the visuals– one of the most inspired works I have seen in a very, very long time. Simply amazing. Shame the script was so blah. What exactly is confusing about this film, aimed at kids? He has to go into the woods to get some berries to make ink. He does that, meets a spirit, and then the two of them become friends. Vikings attack. Book gets finished. The animation style took a bit to get used to when I first watched Song of the Sea, but anything is sweeter with a young Irish accent.